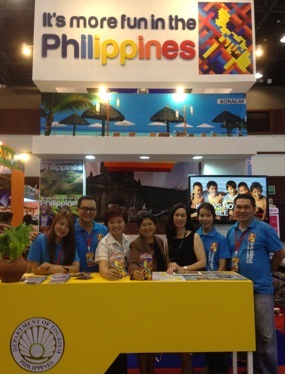 Honorable Jocelyn Batoon-Garcia, Philippine Ambassador to Thailand (fourth from left) visited the Philippine Booth .Photos by DOT. The Department of Tourism (DOT) won the Best Booth Display during the Thai International Travel Fair held on February 14-17, 2013, in Bangkok, Thailand, extending the Philippine tourism’s winning streak in the global stage. The Philippine booth bested fourteen other National Tourism Organizations (NTOs), marking the country’s debut in the said travel fair. Organized by Thai Travel Agents Association (TTAA), an association of Thai Outbound Tour Operators, the three-day fair held at the Queen Sirikit National Convention Centre in Bangkok drew almost 600,000 visitors and close to a thousand booths from 14 NTOs, 3 embassies, 19 airlines, 132 travel agents, and other travel-related suppliers. The Thai Minister of Culture, Mr. Sontaya Kunplone, was among those who graced the official opening ceremony. This maiden Philippine participation led by DOT’s Marketing Representative for Malaysia and Thailand, Datin Melissa Ong, was able to book Manila, Cebu, Bohol, and Palawan with a sizeable number of Thai tourists. Cebu Pacific cabin crew also provided onsite entertainment and fun games throughout the fair. “There is no stopping the country from riding high on a wave of global attention. This is certainly another feather in our cap. As the world’s perception of the Philippines begins to improve, all the more should the groundwork begin on market development—our topmost and crucial job for the next three years. We have definitely managed to hit the ground running in Thailand with this winning feat,” Secretary of Tourism Ramon R. Jimenez Jr. said. 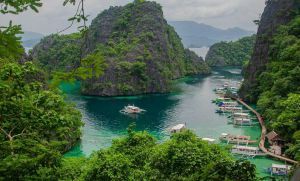 Considered a new opportunity market for the Philippines, Thailand produced 3,736 visitors in January 2013, registering a double-digit growth of 19.55% from the same period last year. 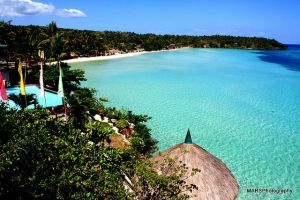 In 2012, a total of 40,987 Thai tourists (or 10.9% of the visitor volume from ASEAN region) came to the Philippines.